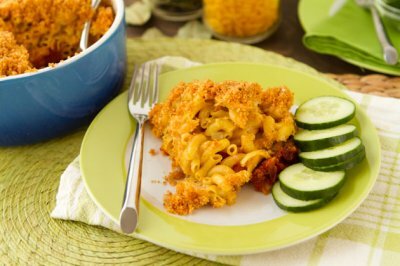 This casserole combines two comfort food classics – hearty chili and cheesy homemade mac ‘n cheese for a delicious all-in-one gluten-free, vegan dinner. Preheat oven to 350F and spray a 5 cup casserole dish with non-stick cooking spray. Set aside. Weigh your pasta, bring a large pot of water and salt to a boil. Add pasta and cook to al dente. Once desired consistency is met (at about 4 minutes), drain and set aside. To make the chili, place 1 teaspoon of olive oil in a medium-sized sauce pan on medium heat. Add onion, garlic, and sauté for 5-6 minutes. Add pasta sauce, kidney beans and spices. Reduce heat to low, cover, and simmer for 10 minutes. 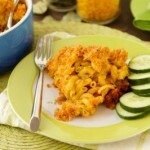 Remove from heat and place at the bottom of a 5 cup casserole dish. Set aside. To make the cheese sauce, place 1 tablespoon of olive oil brown rice flour and dry mustard in a separate large saucepan. Mash with a fork or spoon until fully combined. Make sure it’s free of lumps. Stir in the milk, onion, bay leaf, and paprika. Simmer for ten minutes, then remove the bay leaf. Stir in 3 ounces of the cheese, season with salt and pepper, and fold the cooked macaroni into the mix. Now it’s time to create your casserole! Drop macaroni mixture on top of the chili mixture in the casserole dish. Toss the breadcrumb topping ingredients in a small bowl and mix with fingers to coat. Top the macaroni with the bread crumbs. Place in your preheated oven and bake for 30 minutes, until the top is golden. Remove from oven and rest for five minutes before serving. Pair with a side of fresh veggies or crisp salad and you have a meal that will catch the eye of any cheese lover. Store in the fridge in an air-tight container for up to 3 days. Or freeze to prolong life!